The Sheriff’s principal duties involve the charge and custody of the County Jail. His department handles both criminal and non-criminal complaints, enforces traffic and water safety laws, as well as serves writs and other court papers. The Sheriff’s Department also transports criminals to either court or prison and handles extradition proceedings. The Sheriff is elected to a 4 year term by the voters of Shiawassee County on a partisan ballot in the November general election. 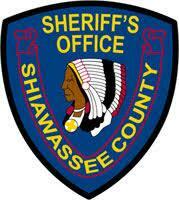 The mission of the Shiawassee County Sheriff’s Office is to provide for the protection and preservation of public safety, to nurture partnerships within the community through education and cooperation and to maintain the effective and efficient operation of a secure and humane correctional facility. This program allows eligible victims and witnesses to obtain reliable and timely information regarding a criminal alien's release from custody.